We arrived here yesterday and found one other motorhome here then, we parked as usual some 8/10ft away as plenty of space, and 2 others came later, one parking very close to us on one side….why? loads of room…. There is also a converted lorry here, with an a/c in front, and door at rear, as yet we have seen no one except a dog, the door opens and a dog comes out and it goes in and a door closes, but no person. In front is a childs playground, doesn’t seem to be much used really and a rugby pitch to the left. 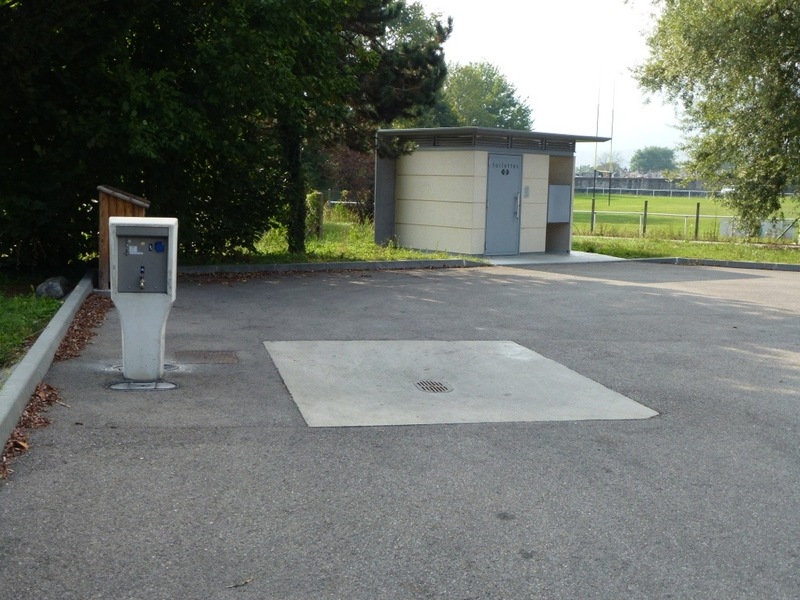 There is an UrbaFlux borne €2 for water (2 x €1 pieces), which we plan to use tomorrow. By the side are some toilets and I think a shower. As we don’t need I haven’t investigated – also rubbish bins and lights which weren’t on last night. Weather has been lovely, we walked this morning into the town, about 1km took around 13 mins. We found the TO and got some literature, wandered in and out of shops and found the Cathedral which was open and we ventured in. It is highly decorative and decorated, more so than any I think I have seen in France. Back for lunch and a quiet afternoon, reading the literature and catching up on this…. Moving on tomorrow, but not exactly sure yet where we will stop over, we need to find a garage and get some gas (GPL) here and I have located one or two en route. We can’t always manage to get into them. We couldn’t when we filled up at Super U on our way here…. It was much too tight for the vehicle to get between that and a metal bar down the side, separating the 24/24 bit from the Caisse bit…. very bad planning, if it isn’t that the height is too low, 3.1m last time…. so keeping fingers crossed so we can get some so fridge doesn’t stop working in this heat. Temp 27 today…. but not unpleasant.